After doing my post on green cleaning, I started thinking about how much money I was saving by not buying commercial cleaning products and how much safer I felt my family was without being exposed to all those chemicals. I started thinking of other ways to cut chemicals and unnatural products out of our lives and decided a great place to start would be some beauty items. I’m not fancy, I’m mostly a chap-stick-and-mascara-hair-in-pony kind of girl, but I’m a sucker for a smelly lotion or delicious lip balm. So I started hunting around Pinterest and blogs that boast natural or raw living ideas. I came up with 4 products I wanted to start making and one afternoon, I got to work. I ended up with lip balm, body butter, sugar scrub and lotion bars. The lip balm was one of the things I was most excited about. I seem to go through it at an extraordinary rate. I get tired of shelling out the money, even for my cheapy Vanilla Lip Smackers (I know, but I can’t help myself! I swear I’m 30, not 13. ), and I really cringe to hand over $3 or $4 for something a little fancier. I simply melted my beeswax and oil together in a bowl in the microwave until melted. Added some strawberry flavor to it and stirred well, then dumped it in my pots. I found these pots at Hobby Lobby for $.79 each and they hold .5 ozs. I only got 4, but ended up with enough lip balm left over to make probably 2 more. I put what was left into an old baby food container and gave it to my 4 year old. I had leftovers, but I just did the math for what I had here. Each pot of lip balm cost me $.45 for half and ounce. My lip smackers run $1.49 these days and are .14ozs each. I LOVE body butter. It’s so silky and smooth and has an amazing ability to soften any part of your body, no matter how rough. I have this weird thing with my feet and I have to slather them with lotion before I go to bed every night. If it’s not good lotion, I’ll wake up in the middle of the night and they’ll be too dry and I’ll have to lube them up again. 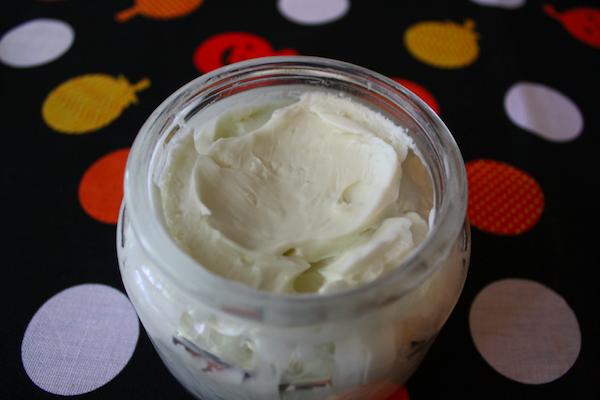 I love body butter for this exact reason–it keeps them nice and hydrated all night and most of the next day. The thing I don’t like about body butter? Its price tag! I put all the ingredients into a large bowl inside a pot of water on the stove and simmered until it melted. Once it was all liquid, I put the bowl in the fridge. It was taking too long to firm up, so I stuck it in the freezer instead. Once the liquids had turned back to almost a solid state, I used my hand mixer to whip them. The consistency is something like icing and it smells heavenly! I put my body butter into these jars. I grabbed them 50% off and gave one to a friend. Each jar was 8oz (they’re not stuffed, but nicely filled) and is perfect. You have to be careful not to get this body butter too warm or it’ll “melt” back into a liquid. If that happens you’ll need to melt it all, freeze it again and re-whip it back into butter. At first I wasn’t going to do any kind of scrubs or bath salts/bombs because they’re very common. But my feet need the TLC, especially going into the winter. I try to sit down once or twice a week and scrub them with a good scrub and a pumice stone to keep them soft and crack-free during the winter. And this sugar scrub is so good, you could eat it. Literally! This takes 30 seconds to whip together. You just stir the coconut oil and sugar to incorporate. If you want to add a few drops of essential oils, you can, but I preferred the coconut smell so I didn’t add anything. My scrub fit nicely in a cute jar I grabbed at Hobby Lobby. The oil didn’t really change the amount of sugar, just made it wet, so it’s about 8 ounces. 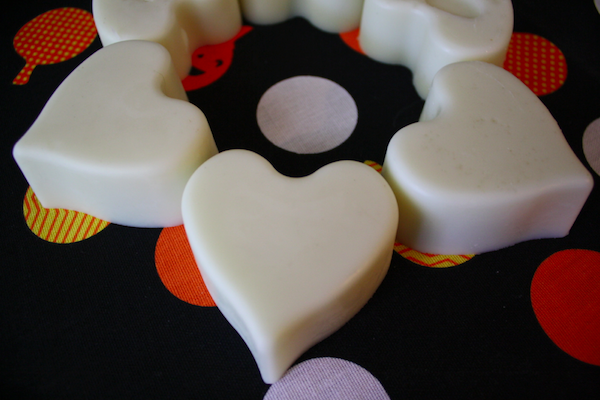 I really enjoy lotion bars because of their versatility. I prefer to keep one in the bathroom and right after a shower, while my skin is still full of moisture, I slather it on and let the oils really soak in. You’re left with incredibly soft and silky skin that’s not greasy or slimy feeling. Again I made a double boiler on my stove and threw all the ingredients in together. The beeswax takes the longest to melt but with stirring frequently, it wasn’t too long. 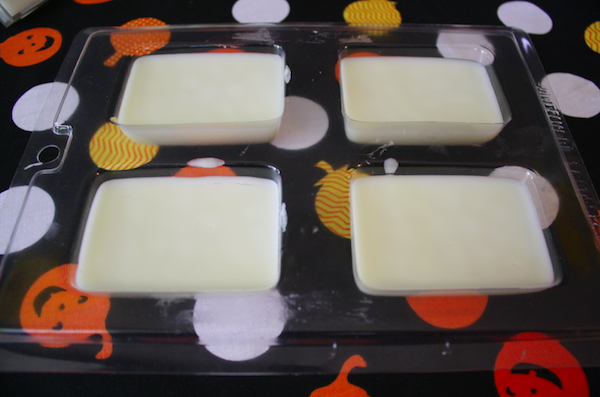 Once all the ingredients were liquified and mixed together, I poured them into molds. I bought a soap mold, but apparently I needed to grease it first because my bars got stuck inside! I had to warm it up a little to get them out and they warped! The rest went into a silicone cupcake mold I have and they came out perfectly. and so many more! 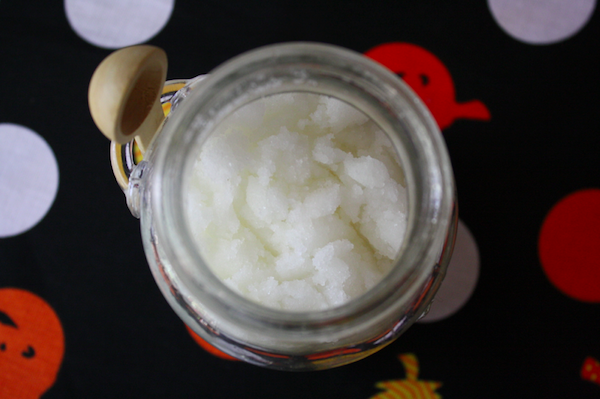 Check out this list of 52 uses for Coconut Oil. At the bottom of the page is a link to 70 more uses, so check them out, too! We can’t sing its praises enough! These are just as amazing as the store bought versions without all the nasty, unnecessary chemical additives. 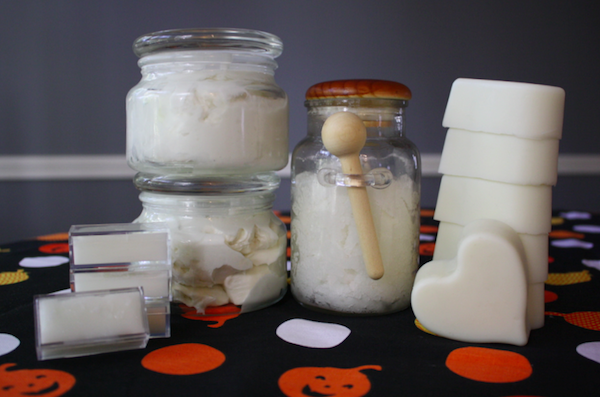 So break out your natural ingredients and start making beauty products today! How big were the bottles of almond oil and Shea butter that you used in the body butter ? And did you use certain brands? The shea butter was 16oz and the almond oil was about the same size because that’s all I could find. I did not go with specific brands for my products, just what was available. Where did you buy the shea butter & bees wax? The shea butter I got at Whole Foods and the beeswax came from Hobby Lobby. Thanks Melissa! Love your blog! Hi Julie! The oils definitely help soften the lotion. I would think you could try without them and if it’s not working well for you, melt again and add the oil. The nice thing about these is that there’s really no one right way to make them! 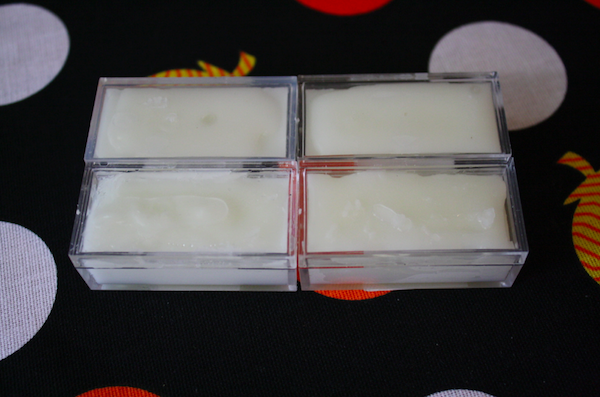 I tried the lip balm, the lotion bars are setting and the body butter is next – all for Christmas presents!! But my stuff all is very yellow in color… not white like yours…. what gives?? I’m not sure! Did you use yellow beeswax for the lip balm? Other than that I can’t think of why your things would be yellow. I’m sure they’re just as yummy, though!